11/07/14 -- EU grains closed mostly lower, helped on their way by a late one-two in the guts from the USDA and FAO. The day ended with new crop Nov 14 London wheat closing GBP1.65/tonne lower at GBP130.55/tonne, Nov 14 Paris wheat was EUR1.25/tonne weaker at EUR180.50/tonne, Aug 14 Paris corn was down EUR1.25/tonne to EUR169.00/tonne and Aug 14 Paris rapeseed was EUR2.25/tonne easier at EUR331.25/tonne. This was a new lowest close for a front month on both London wheat and Paris rapeseed since July 2010, and the lowest on Paris wheat since December 2011. For the week Nov 14 London wheat was down GBP3.95/tonne, with Paris wheat falling EUR4.00/tonne, corn losing EUR2.00/tonne and rapeseed falling EUR6.50/tonne. FranceAgriMer said that the French winter wheat harvest is just about underway, at 2% done nationally as of Jul 7. This time last year nothing had yet been cut. Despite some rain this week, the winter barley harvest advanced from 44% done a week ago to 78% complete as of Monday. A year ago only 4% of the crop had been cut by the end of the first week in July. They also said that 7% of the French corn crop is at the silking stage, up from 1% a week ago and versus zero this time last year. As far as crop conditions go, they rated 70% of the French winter wheat crop to be in a good/very good state, up a point on a week ago and 2 points ahead of this time last year. The French corn crop was rated 83% good/very good, unchanged on a week ago and far better than only 56% this time in 2013. Late in the day the USDA raised their estimate for the world wheat crop in 2014/15 by 3.6 MMT from last month to 705.2 MMT. "This is down 9.0 MMT from last year but still the second largest production on record. The biggest foreign increases are 1.6 MMT for the EU and 1.0 MMT for Ukraine both due to continued favourable weather," they said. Production in the EU is now forecast at 147.9 MMT, a 3.2% increase on last year. Ukraine's crop is now estimated at 21 MMT, down versus 22.3 MT a year ago, but nowhere near as bad a crop as was feared earlier in the year. World wheat ending stocks in 2014/15 were raised by almost 1 MMT to a plentiful 189.5 MMT, which is more than 5 MMT higher than in 2013/14. The FAO's OECD meanwhile estimated the global wheat crop in 2014/15 even higher than the USDA, at 710.5 MMT, which they say is 18.4 MMT above the prior 3-year average. They also forecast the world 2014/15 coarse grain crop at 1.273 billion tonnes versus the previous 3-year average of 1.208 billion and the USDA's 1.261 billion. "For coarse grains, the production response to the high prices in recent years is expected to be especially strong in the United States, the Russian Federation and Argentina. Global demand will not be able to absorb this supply at current prices," they said. "Crop prices are expected to drop for one or two more years, before stabilizing at levels that remain above the pre-2008 period, but significantly below recent peaks," they suggested. 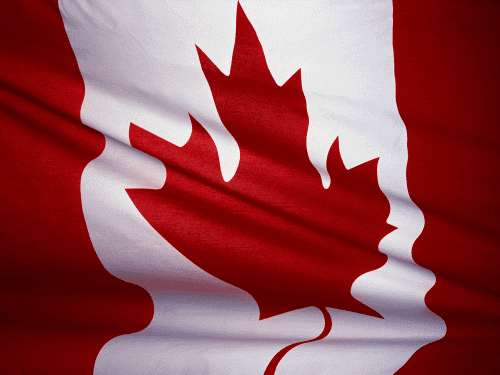 Record Canadian Wetness Causing Crop Losses? Widespread flooding in Saskatchewan and Manitoba has claimed a portion of the wheat crop, though exactly how much wheat has been lost is not clear. Flood damage may be worse than 2010, when 14% of the wheat crop was lost with less-extreme flooding. 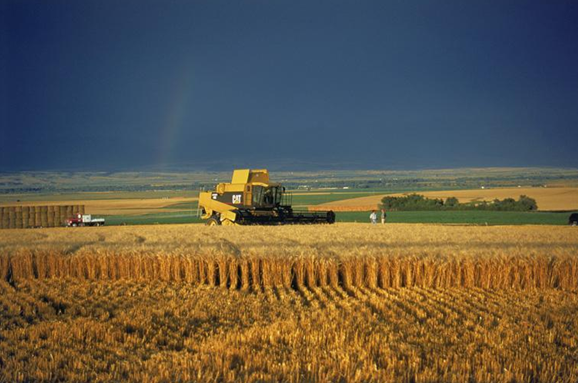 Statistics Canada had originally predicted a 7.4% decrease in the wheat planted area, year over year, but this survey was conducted in mid June before widespread flooding developed. Excessively heavy rainfall of 100-150 mm developed during the last week of June. Up to 260 mm of rain occurred in eastern Saskatchewan and western Manitoba, submerging crops, washing out roads and forcing hundreds of people to leave their homes, says Rod Nickel, reporting for the Reuters News agency. Last year's bumper grain harvest meant a very significant amount of grain was still in storage bins on the farm, and subject to flooding. Damage inside grain bins was in addition to widespread farmland flooding. Around 71.75 million acres of crops were planted, all together, based on the June survey from Statistics Canada before the flood. Larry Weber at Weber Commodities in Canada, a DTN affiliate, predicts 6 million acres of crops may have been killed by flooding. Another 2.1 million acres weren't planted at all, due to bad weather, he predicts. Wheat is the main crop produced in Canada making up 34% of all grains. Canola is the second most important crop with a 28% share of the grain harvest. Barley and soybeans were also flooded, although these crops are only one-fourth as large as the wheat crop. While nobody knows for sure how badly grains were damaged, agronomists have weighed in on the issue. Most plants can tolerate a couple of days of flooding during the growing season, but for some plants, a week or more of flooding can cause severe injury and death, according to Nathan Mueller, South Dakota State University Extension agronomist. The 2010 growing season was similarly wet, though the 2010 flood was in western Saskatchewan and eastern Alberta. Twice normal rainfall developed April to June. That compares to record flooding this season. Producers were not able to get their wheat all planted, contributing to a 24% reduction in the wheat area sown. The wheat yields were rather good, near average, but a sharp reduction in the planted area drove production down. In the end the 2010 wheat harvest was 23.3 million metric tons and 14% less than the previous year. 10/07/14 -- Soycomplex: Beans closed closed 4 to 10 cents lower. Weekly export sales of 56,300 MT of old crop and 526,500 MT of new crop were towards the top end of trade estimates of 250,000 to 650,000 MT. The average trade yield estimate for Friday's USDA report is 45.1 bu/acre, according to a Bloomberg survey. Old crop ending stocks are expected to be around 128-130 million bushels, rising to over 400 million for new crop. Jul 14 Soybeans closed at $13.29 3/4, down 4 3/4 cents; Nov 14 Soybeans closed at $10.93 1/4, down 10 1/2 cents; Jul 14 Soybean Meal closed at $434.00, down $5.50; Jul 14 Soybean Oil closed at 37.27, up 23 points. Corn: The corn market closed around 3 to 6 cents lower on the day. Front month Jul 14 just about managed to close above $4/bu, although Sep 14 and Dec 14 didn't come close. Weekly export sales of 363,000 MT of old crop and 381,600 MT of new crop were slightly ahead of trade forecasts for a combined 500-700 TMT. The average trade guess for US corn yields on Friday is 165.9 bu/acre, with some suggesting that the current "non-threatening" outlook could see final yields end up close to a record 170 bu/acre. Old crop ending stocks are expected to rise to 1.233 billion bushels, with new crop stocks at something like 1.8 billion. Jul 14 Corn closed at $4.00 3/4, down 3 1/4 cents; Sep 14 Corn closed at $3.85 3/4, down 5 1/2 cents. Wheat: The wheat market closed anywhere from unchanged to 6 cents lower across the three exchanges. Despite the recent slide in prices there was little sign of a short-covering rally heading into tomorrow's USDA report. Weekly export sales came in at only 338,100 MT which was a bit below most trade expectations. The average trade guess for US all wheat production tomorrow is at 1.964 billion bushels, with ending stocks seen around the 590 million level. Canada analysts are saying that as many as 3.0 million acres intended for spring grain (mostly wheat) and canola planting were lost due to wet weather. Jul 14 CBOT Wheat closed at $5.36 1/4, down 3 1/4 cents; Jul 14 KCBT Wheat closed at $6.57 1/2, down 3 1/4 cents; Jul 14 MGEX Wheat closed at $6.40, unchanged. 10/07/14 -- EU grains closed mixed, attempting a bit of light consolidation/profit-taking following the recent rout ahead of tomorrow's USDA WASDE report. New crop Nov 14 London wheat finished GBP0.20/tonne higher at GBP132.20/tonne, Nov 14 Paris wheat was unchanged at EUR181.75/tonne, Aug 14 Paris corn was up EUR0.50/tonne to EUR170.25/tonne and Aug 14 Paris rapeseed finished EUR0.25/tonne weaker at EUR333.50/tonne. Nearby Nov 14 Paris wheat equalled a 5-month low of EUR181.50/tonne, closing just above that level. A break below EUR180/tonne could have serious downside consequences. The German farmers cooperative estimated the wheat crop there at 25.46 MMT, a 1.8% rise on last year. They forecast the German rapeseed crop at 5.97 MMT, a 3.5% rise versus 2013. Winter barley production is seen at 8.75 MMT, up 4.2%, although the spring barley crop will decline to 1.91 MMT, a 1.3% fall as low levels of winterkill reduced spring plantings. The German 2014 corn crop will leap 17.4% to 5.15 MMT, they estimated. Brussels said that it had issued 329 TMT worth of soft wheat export licences this past week, taking the new 2014/15 seasonal total to 350 TMT. They also granted 304 TMT worth of barley exports and issued corn import licences for 125 TMT. Ukraine said that their early grain harvest had now reached 7.83 MMT, with yields up 7% at 2.93 MT/ha. Wheat accounts for 4.21 MMT of that, with yields averaging 3.06 MT/ha, and the barley harvest thus far totals 3.51 MMT, with yields at 2.82 MT/ha. They've also harvested 585 TMT of OSR with an average yield of 1.99 MT/ha. The Russian grain harvest meanwhile now totals 12.4 MMT, with an average yield of 3.53 MT/ha, a 12.8% increase compared to 2013. Wheat accounts for 9.2 MMT of that, off 10.1% of the planned area with yields at 3.64 MT/ha versus 3.18 MT/ha in 2013. They've also harvested 2.1 MMT of barley and 220 TMT of OSR. The UAE bought 69,000 MT of US and South American corn for Nov-March shipment along with 30,000 MT of Australian barley for November shipment. 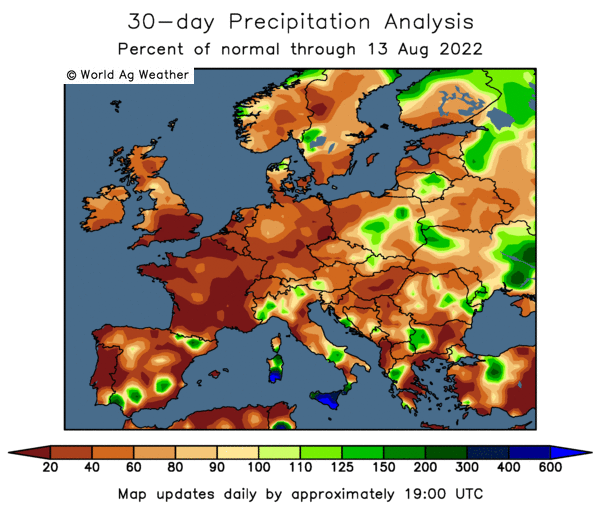 Reports out of Romania suggest that the early wheat harvest is displaying protein levels similar to last year's levels, contrary to some suggestions that heavy rain in May and June may have damaged quality there. That may help explain their recent successes in Egyptian tenders. The Bank of England left UK interest rates unchanged at 0.5%, as was widely expected. The prospect of a rate hike later in the year still underpins the pound however, which adds to the bearish tone for London wheat prices. 09/07/14 -- Soycomplex: Beans closed mixed, but mostly lower save for the front end. Non threatening US weather and the outlook for a record large by some considerable distance 2014 US soybean crop has the market on the defensive. Both US and global 2014/15 soybean ending stocks are also expected to be pitched at record levels when the USDA releases it's latest world supply and demand numbers on Friday. This will be the first report in which they will reflect their Jun 30 US acreage estimate which stunned the market into retreat. In case you've forgotten, that said that US farmers will planted nearly 85 million acres of soybeans this year - a record by more than 7 million acres. US ending stocks for 2014/15 are therefore seen rising to over 400 million bushels, the most since 2006/07. In other news, Conab estimated Brazil's 2013/14 soybean crop at 86.27 MMT versus a previous estimate of 86.1 MMT. The Rosario Grain Exchange also tweaked their Argentine soybean production estimate for 2013/14 a little higher to a record 55.7 MMT versus a previous estimate of 55.6 MMT and the current USDA figure of 54.0 MMT. Trade estimates for tomorrow's weekly export sales report for beans are in the 250,000 to 650,000 MT range. Jul 14 Soybeans closed at $13.34 1/2, up 4 3/4 cents; Nov 14 Soybeans closed at $11.03 3/4, down 12 1/2 cents; Jul 14 Soybean Meal closed at $439.50, up $2.20; Jul 14 Soybean Oil closed at 37.04, down 76 points. Corn: The corn market closed lower, with Sep 14 and Dec 14 ending below $4/bushel setting contract lows. As well as further fund liquidation/building of new shorts, light producer selling was also noted as the troops throw in the towel, said Benson Quinn Commodities. "The next downside objective in Dec corn is the $3.85 level," they said. Friday's USDA report is expected to suggest a 2014 US corn yield potential of close to 166 bu/acre versus 165.3 bu/acre in June. Some in the trade are now factoring in final yields of up to 170 bu/acre, Benson Quinn suggest. That would be the highest average US corn yield ever, and by some distance. The USDA announced 101,600 MT of US corn sold to Japan for 2014/15 shipment, along with 107,696 MT sold to unknown. Conab estimated the Brazilian 2013/14 corn crop at 78.20 MMT versus a previous estimate of 77.9 MMT and compared to 76 MMT from the USDA in June. China are to attempt to auction off another 5.0 MMT of surplus corn stocks from reserves today and tomorrow. The Energy Dept said that weekly US ethanol production was 927,000 barrels/day, down 26,000 bpd from the previous week. Trade forecasts for tomorrow's weekly export sales report for corn are in the region of 500-700 TMT. Jul 14 Corn closed at $4.04, down 4 1/4 cents; Sep 14 Corn closed at $3.91 1/4, down 7 cents. Wheat: The wheat market slumped to fresh lows for the recent move. All the new lows did was stimulate further speculative selling it appears. The Black Sea confirmed it's grip on the world wheat export market, with Romania selling four cargoes of wheat for August shipment to Egypt's GASC. The prices paid were around $1-3 cheaper than last week's purchase. US wheat wasn't even offered on this occasion. Conab estimated the Brazilian 2014/15 wheat crop at 7.40 MMT versus a previous estimate of 7.37 MMT. The USDA currently estimate Brazil's 2014/15 wheat crop at only 6 MMT. Conab estimated Brazil's wheat import needs in 2014/15 at 5.5 MMT, which is 1 MMT less than the USDA currently predict. The Rosario Grain Exchange trimmed their forecast for Argentine wheat plantings for 2014/15 to 4.24 million hectares versus a previous estimate of 4.4 million. That's still a little higher than the USDA's 4.2 million ha estimate, and a 21% jump on the 3.5 million ha planted last year. There's an improving weather forecast for spring wheat on the Canadian Prairies for the next 5-7 days. Japan are tendering for 109,303 MT of wheat for Aug-Sept shipment from the US and Canada. Trade estimates for tomorrow's weekly export sales report from the USDA are around 400-650 TMT. Jul 14 CBOT Wheat closed at $5.39 1/2, down 5 3/4 cents; Jul 14 KCBT Wheat closed at $6.60 3/4, down 14 1/4 cents; Jul 14 MGEX Wheat closed at $6.40, down 12 cents. 09/07/14 -- EU grains markets finished lower again, in a continuation of the recent theme. Nov 14 London wheat set a fresh contract lifetime closing low, and also finished at a fresh lowest close for a front month in almost 4 years. The day finished with Nov 14 London wheat down GBP1.00/tonne at GBP132.00/tonne, Nov 14 Paris wheat ended EUR1.50/tonne lower at EUR181.75/tonne, Aug 14 Paris corn was down EUR1.75/tonne at EUR169.75/tonne, whilst Aug 14 Paris rapeseed fell EUR2.00/tonne to EUR333.75/tonne. There's talk that cash-strapped and short of storage Ukraine farmers being forced into taking "whatever they can get" for new crop wheat and barley. There are reports that new crop Ukrainian 11.5% milling wheat traded at $247/tonne FOB, which is a very sharp price and the equivalent of GBP147/tonne. New crop Ukrainian corn meanwhile is now said to have fallen below $200/tonne FOB the Black Sea. Egypt's GASC bought four cargoes of Romanian wheat for late August shipment, paying around $249-251 FOB, with freight of some $10-11/tonne to add on top. That's a few dollars less than their last purchase a week ago which came in at around $252/tonne FOB. It may also indicate that quality concerns regarding Romanian wheat may be premature. A panel of Russian experts were said to have estimated this year's grain crop at 94-99 MMT versus 92.4 MMT a year ago. Exports in 2014/15 will rise to 27-30 MMT versus 25.37 MMT in 2013/14, they forecast. The Russian Ministry said that the country had harvested 11.7 MMT of grain so far off 7.2% of the planned area. Yields are said to be averaging 3.54 MT/ha, a 12% increase on this time a year ago. Wheat accounts for 7.4 MMT of that total off 8.3% of the intended area, with yields coming in at 3.55 MT/ha, a near 10% increase on 2013. FranceAgriMer estimated the French 2014 wheat crop at 36.7 MMT, almost identical to last year's production. They estimated 2013/14 French wheat ending stocks at 2.7 MMT versus 2.9 MMT a year ago. The French port of Rouen said that it had exported 7.45 MMT of grains in 2013/14, a 15 year high. Wheat accounted for 6.6 MMT of that, a 22% rise versus 12 months previously. The leading home was Algeria taking 3.5 MMT. They will be looking in that direction again in 2014/15. Algeria estimated their 2014 cereal crop at 3.2-3.3 MMT, a sharp fall on 4.9 MMT a year ago, due to low April rainfall. Grain consumption here is around 8 MMT per annum, so they are likely to be even larger buyers of French wheat and barley again in the year ahead. Jordan are tendering for 100,000 MT of optional origin hard milling wheat. Wheat still can't buy a rally it would seem, despite some pick up in demand from North Africa and the Middle East, as harvest pressure continues to weigh on the market. Meanwhile "distressed" Black Sea sellers continue to drive prices lower. 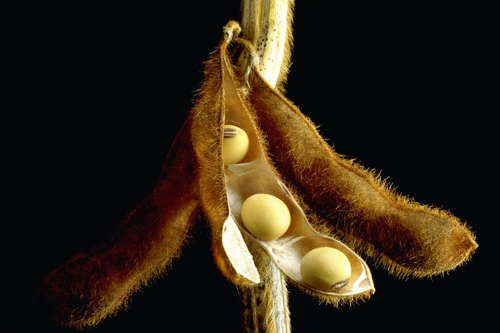 08/07/14 -- Soycomplex: Beans crashed lower for a seventh straight session, with the front end bearing the brunt of losses. Jul 14 beans have now fallen more than $1/bushel since last Monday's USDA stocks and acreage report, whilst meal is down more than $30 during that time. Last night's statement from the USDA that 72% of the 2014 US soybean crop is in good to excellent condition is also weighing on prices, as fund money appears to be scrambling to get out of their bean longs before the harvest kicks off in the Deep South only a month from now. Funds were said to have been net sellers of around 5,000 soybean contracts on the day. US weather maintains a non-threatening outlook. 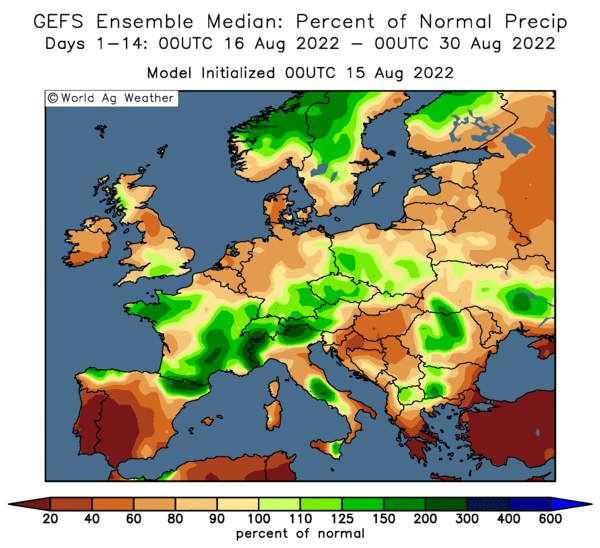 "Forecasts remain favourable for crop development with a mix of sunshine, normalish temps and scattered showers to benefit areas that simply haven’t seen dry or hot conditions to this point. A slightly drier pattern may benefit soybeans that have had too much moisture," said Benson Quinn Commodities. 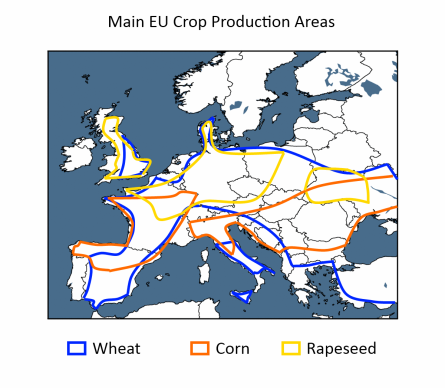 Bumper rapeseed production in the EU may curb demand for soybeans here. Strategie Grains forecast a record EU-28 rapeseed crop of 22.5 MMT, up 700 TMT on their previous estimate and 6.6% above output last year. The French Farm Ministry forecast a rapeseed crop there of 5.217 MMT, a 19.4% increase on last year's production of only 4.37 MMT. Jul 14 Soybeans closed at $13.29 3/4, down 33 1/4 cents; Nov 14 Soybeans closed at $11.16 1/4, down 9 1/4 cents; Jul 14 Soybean Meal closed at $437.30, down $6.40; Jul 14 Soybean Oil closed at 37.80, down 56 points. Corn: The corn market ended with losses of around 1-2 cents. Fund selling was estimated at something like a net 5,000 lots on the day. As with beans, the US weather outlook is generally viewed as non-threatening. Last night's news that 75% of the US crop is in good to excellent condition weighs, as this is said to be the highest rating in 20 years at this point. "Expect a mix of light showers, sunshine and normal temps to continue as the bulk of the corn crop pollinates," said Benson Quinn Commodities. One month more of those kind of conditions and the crop could largely be made. There's now talk of average US 2014 corn yields of close to 166 bu/acre this year. Russia said that it had exported a record 4 MMT of corn in 2013/14. 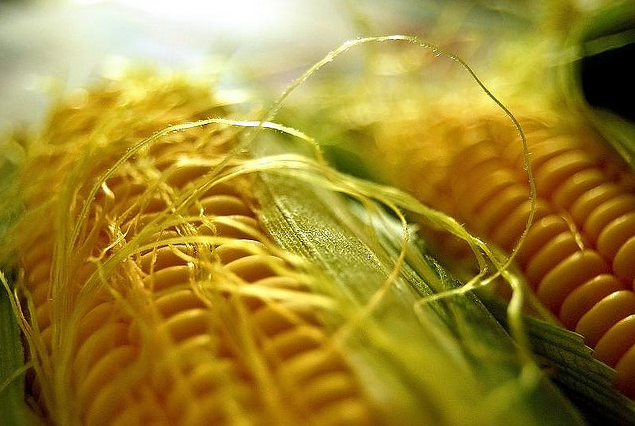 Ukraine said that it had exported 169 TMT of corn in the first week of the 2014/15 marketing campaign. Current forecasts suggest that they may harvest something fairly close to last season's record 30.9 MMT crop again in 2014, despite all the early season doom and gloom. The French Ministry pegged the 2013 corn crop there at a shade over 15 MMT. They haven't yet released a forecast for production this year. Jul 14 Corn closed at $4.08 1/4, down 1 cent; Sep 14 Corn closed at $3.98 1/4, down 2 1/4 cents. Wheat: The wheat market closed mixed, but mostly lower. Egypt are testing the water again with an overnight tender for wheat for late August shipment. They bought three cargoes of Romanian and one of Russian origin last week. The price paid was said to be around the $252/tonne FOB mark, with around a further $10-11/tonne freight on top. US wheat was comfortably outpriced, and probably will be again this time round. Russia's Ag Ministry said that the country has harvested 6.1 MMT of wheat so far this season, off 6.4% of the planned area. Yields are said to be up 17% on year ago levels. They also said that Russia exported 25.373 MMT of grain in 2013/14, a 61.8% increase on the previous season. Wheat accounted for 18.3 MT of that total. ProZerno said that Russian new crop milling wheat prices should range RUB6,800-7,500/tonne ex farm, around GBP116-128/tonne. Russian 12.5% milling wheat is said to be offered in the market at around the equivalent of GBP147/tonne FOB the Black Sea, around GBP10/tonne cheaper than German origin FOB the Baltic. The French Ministry estimated the 2014 soft wheat crop there at 36.51 MMT, a 1% decrease on last year. French customs data said that France had exported 859,000 MT of wheat outside the EU in May, with volumes dominated by shipments to Algeria who accounted for 623,381 MT of that total. Jul 14 CBOT Wheat closed at $5.45 1/4, up 1/4 cent; Jul 14 KCBT Wheat closed at $6.75, down 3 1/2 cents; Jul 14 MGEX wheat closed at $6.52, down 5 cents. 08/07/14 -- EU grains closed mixed, with new crop Nov 14 London wheat closing GBP0.20/tonne lower at GBP133.00/tonne, Nov 14 Paris wheat was EUR0.75/tonne higher at EUR183.25/tonne, Aug 14 Paris corn was up EUR1.25/tonne to EUR171.50/tonne and Aug 14 Paris rapeseed was EUR1.50/tonne firmer at EUR335.75/tonne. Nov 14 London wheat set a new lifetime contract low of GBP132.00/tonne, but Nov 14 Paris wheat managed to hold above the key level of EUR180.00/tonne. 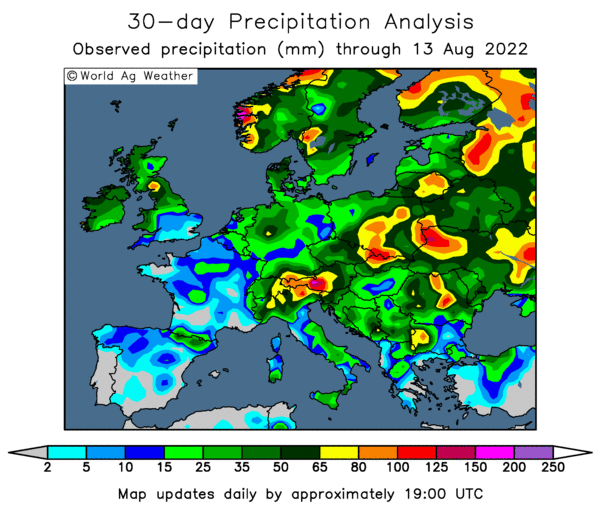 There are still enough concerns about wheat quality around in Eastern Europe and the FSU to support that - at least for now. The EU Commission said that Europe exported a record 42 MMT of grain in 2013/14, including 29 MMT of soft wheat, a 43% increase on the 5-year average. They said that barley exports were 32% above the norm at 8.5 MMT. Even so, 2013/14 EU-28 grain ending stocks were placed 4.7 MMT up on year ago levels at 32.5 MMT. They also estimated the 2014/15 EU-28 grain crop at 303 MMT, up 1 MMT on last year and 6% above the 5-year average. Russia said that it had now harvested 9.9 MMT of grains, including 6.1 MMT of wheat off 1.6 million hectares. Wheat yields are averaging 3.78 MT/ha, a 17% rise on this time last year. 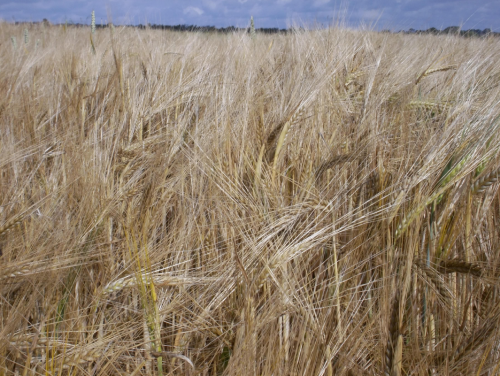 They've also harvested 2.0 MMT of barley off 531k ha, with yields averaging 3.7 MT/ha, a 10% increase on 2013. The Russian Ministry said that the country finished 2013/14 exporting 25.373 MMT of grain, a 61.8% increase on the previous season. Wheat accounted for 18.279 MMT of that total, with corn exports at 4.052 MMT and those for barley at 2.705 MMT. Belarus said that they are expecting a record grain harvest in 2014, beating the previous all time high of 8.7 MMT produced in 2012 and "far exceeding" the 7.6 MMT output of last year. Ukraine said that they had exported 358 TMT of grains in the first week of the new 2014/15 season, including 171 TMT of barley and 169 TMT of corn. They've also loaded a further 86 TMT onto vessels waiting to sail, the Ministry added. Strategie Grains increased their forecast for the 2014 EU-28 rapeseed crop from 21.8 MMT to a record 22.5 MMT, a 6.6% increase on last year. The French Ministry said that they would produce a crop of 5.2 MMT this year, a 19% rise versus 2013. Russian 12.5% milling wheat is said to be offered around $252/tonne FOB deep water ports on the Black Sea, the equivalent of around GBP147/tonne. Ukraine new crop corn is in the market at around $198-200/tonne FOB, circa GBP116-117/tonne. 07/07/14 -- Soycomplex: The entire complex closed lower as US traders came back to their desks in bearish mode after a long weekend break. Despite wetness concerns most seem to view current conditions in the Midwest as non-threatening. The USDA would seem to concur that the outlook is promising, leaving soybean good/excellent crop condition ratings unchanged from at week ago at 72%, which is 5 points ahead of this time last year. Crop emergence is now 98%, which is one point better than average, and 24% of the crop is blooming versus 10% a week ago and 21% normally. Weekly export inspections of 59,959 MT were unimpressive, but nor do they need to be. 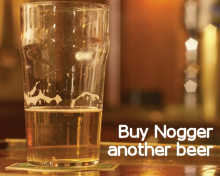 The trade however now seems firmly focussed on new crop prospects. The latest Commitment of Traders report shows fund money continuing to desert the grains sector, including now soybeans too. 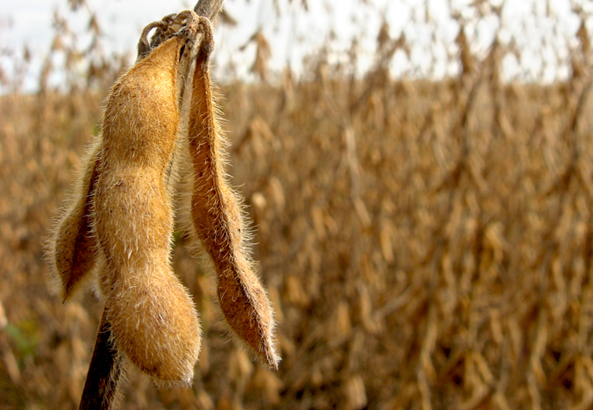 They were estimated to have sold a net 4,000 soybean contracts today. CONAB come out on Wednesday with their revised Brazilian crop estimate updates. Last month they had the 2013/14 Brazilian soybean crop estimated at 86.1 MMT. Jul 14 Soybeans closed at $13.63, down 24 3/4 cents; Nov 14 Soybeans closed at $11.25 1/2, down 8 cents; Jul 14 Soybean Meal closed at $443.70, down $3.30; Jul 14 Soybean Oil closed at 38.36, down 20 points. Corn: The corn market closed sharply lower, slipping to levels not seen on a front month in almost 4 years. Sep 14 dipped below the psychologically important $4/bu mark, although it managed to eventually close just above that critical level. The USDA left corn good/excellent crop condition ratings unchanged from last week at 75% - with a minor shift if 1% extra going into the excellent category. They said that 15% of the crop is silking versus 18% normally, maybe a slight sign that the wet weather in some areas is retarding development a little. Nevertheless, optimism seems high for big yield potential this year. Weekly export inspections of just over 1 MMT were in line with expectations. Fund selling was estimated at a net 10,000 contracts on the day, as they continue to exit corn. The weekly Commitment of Traders report shows the non-commercial (fund/spec) trader reducing their net long to only a fraction over 26k lots as of last Tuesday night. China were reported to have only sold 1.56 MMT of the 5 MMT of corn on offer at last week's government auction. They will attempt to offload a further 5 MMT of surplus stocks this week. Conab are out on Wednesday with their latest 2013/14 Brazilian crop production estimates. Last month they had the Brazilian corn crop estimated at 77.9 MMT. Jul 14 Corn closed at $4.09 1/4, down 7 3/4 cents; Sep 14 Corn closed at $4.00 1/2, down 9 cents. Wheat: The wheat market closed sharply lower across the three exchanges, and with Chicago wheat faring the worst of the bunch. Jul 14 Chicago wheat slumped past the January lows to reach the lowest level seen on a front month since July 2010. Weekly export sales of 417,063 MT were in line with expectations. That takes inspections for the new 2014/15 season to date to 2.3 MMT versus 3.1 MMT this time a year ago. Good harvest weather is finally in the forecast for the Central/Southern US Plains for the week ahead. The weather is also seen co-operating on the Canadian Prairies where it's forecast warmer and drier this week. Both the Russian and Ukraine harvests are running a little behind last year's pace, but yields are around 8-11% higher than in 2013. The USDA reported the 2014 US winter wheat harvest at 57% complete versus 60% normally at this time. They upped the proportion of the crop rated good/excellent by one point from last week to 31%, although that's still 3 points behind year ago levels. Spring wheat conditions were unchanged on a week ago at 70% good/excellent. Spring wheat at the headed stage was 47%, the same as the 5-year average. Conab will report on Brazilian wheat production prospects on Wednesday, last month they estimated the 2014 crop at 7.37 MMT. Jul 14 CBOT Wheat closed at $5.45, down 23 cents; Jul 14 KCBT Wheat closed at $6.78 1/2, down 18 1/2 cents; Jul 14 MPLS Wheat closed at $6.57, down 3 3/4 cents, although other months posted double digit losses. 07/07/14 -- EU grains had a quiet morning, with the overnight Globex market remaining closed following Friday's Jul 4 celebrations across the pond. That all changed when US markets kicked into life in afternoon trade, and a sea of red opening in Chicago drew a similar response here in Europe. The only contract that didn't end lower was expiring old crop Jul 14 London wheat, which went off the board officially unchanged at GBP132.20/tonne. New front month new crop Nov 14 finished GBP1.30/tonne lower at GBP133.20/tonne. Nov 14 Paris wheat was down EUR2.00/tonne at EUR182.50/tonne, Aug 14 Paris corn slipped EUR0.75/tonne to EUR170.25/tonne and Aug 14 Paris rapeseed finished EUR3.50/tonne weaker at EUR334.25/tonne. Nov 14 London wheat set a new lifetime contract low of GBP133.00/tonne, and the spread between that and Nov 15 has tonight widened to over GBP10.00/tonne. Chicago corn prices hit 4-year lows, falling below $4 on the September future, and with Dec 14 only just managing to hold above those levels. Benign weekend weather in the US was the reason for the fall, with some analysts saying that conditions are "almost ideal" and "superb" for corn entering July pollination - for all the recent talk of excessive wetness. London wheat and Paris rapeseed have already fallen below support levels to trade at 4-year lows, and Paris wheat is threatening to test long-term support around the EUR180-181/tonne mark, a level that hasn't been breached since late 2011. The nattily named Ukrgidromettsentra said that Ukraine's 2014 grain crop could reach 63 MMT, close to last year's record, if production of around 1.0 MMT from Crimea was still factored in. They see the Ukraine 2014 winter wheat crop rising from 21.8 MMT last year to 22.5 MMT, with spring wheat output up from 0.42 MMT to 0.44 MMT. Winter barley production will rise from 2.8 MMT to 3.6 MMT, and the spring crop will be up from 4.68 MMT to 5.3 MMT. Ukraine's 2014 corn crop meanwhile will just fall short of last season's bin-busting 30.9 MMT, but not by too much at 29.3 MMT, they said. The Ukraine Ministry said that the early spring grains harvest (which excludes corn) was now 17% complete as of Jul 4 on 1.636 million hectares, producing a crop of 4.664 MMT to date with yields averaging 2.85 MT/ha. That's slower than last season's pace when 2.695 million ha had already been harvested, producing 7.118 MMT of grains, as this year's harvest has been hampered by rain. Even so yields are 8% up on last year. 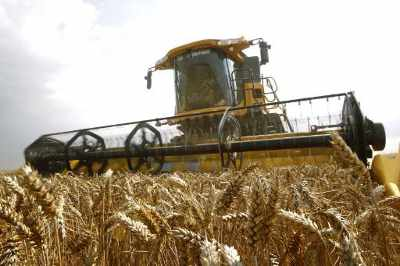 Winter wheat has been cut on 661k ha, producing 1.936 MMT with yields averaging 2.93 MT/ha, with winter barley cut on 946k ha, producing 2.671 MMT with yields at 2.82 MT/ha, they said. The Russian Hydrometeorlogical Centre said that the Russian 2014 grain harvest would beat last season's total of 92.4 MMT, and would "significantly exceed the 5-year average" without giving an exact forecast. The Russian Ministry have production this year at 97 MMT. The Russian Ministry said that their harvest is also slightly behind year ago levels at 8.3 MMT off 2.3 million ha, versus 10.6 MMT off 3.2 million ha in 2013. Yields however are better than last year here also, averaging 3.68 MT/ha, a more than 11% increase. IKAR said that Russia already has around 5 MMT of new crop wheat forward sold, however in Europe one French trader told Reuters "the context is very different from last year when there were a lot of sales already booked to offer shipments for the newly arrived crop. This time we only have Algeria as a harvest outlet." Germany's DBV forecast the wheat crop there at almost 25 MMT versus 24.6 MMT a year ago. They see rapeseed production at similar levels to last year - 5.7 MMT. Prices at these levels are at least stimulating some buying interest, but these orders will be fiercely contested over. Algeria last week bought 100,000 MT of optional origin barley for Oct/Nov shipment. Turkey are tendering for 235,000 MT of optional origin milling wheat for Aug-Oct shipment, whilst the also seek 200,000 MT of barley of optional origin for Aug-Sept shipment. The UAE is in for 100,000 MT of corn and 30,000 MT of barley, although South America and Australia are the preferred origins. Morocco also seeks 170,000 MT of wheat, but intends to buy it on the domestic market.